Windows 7 lets you customize your Start Menu to make it work the way you want it to. You can make a number of changes to the Start menu, from adding or removing items, deciding whether to display recently opened items, and even control the way Windows responds when you click Start Menu options. You see the Taskbar and Start Menu Properties dialog box. On the Start Menu tab, click the Customize button. Select or deselect the features you want to enable or disable. 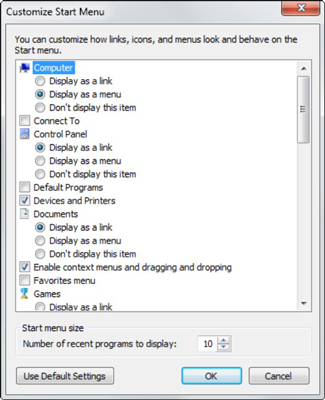 Display as link — Almost all items on the Start menu are displayed as links. Display as menu — Shows the item as a fly-out menu. Don’t display this item — Removes the entry from the Start menu. You can stop Windows 7 from displaying the names of the files you recently opened if you want to protect your privacy. 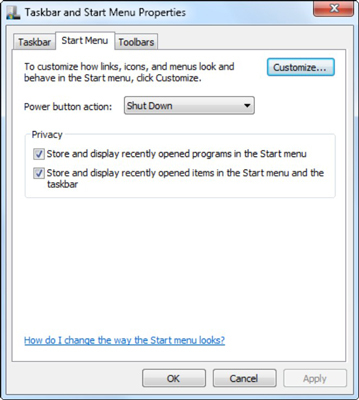 Simply deselect the Store and Display Recently Opened Programs in the Start Menu and the Store and Display Recently Opened Items in the Start Menu and the Taskbar check boxes, which appear at the bottom of this options list. Click the OK button twice when you’re done. 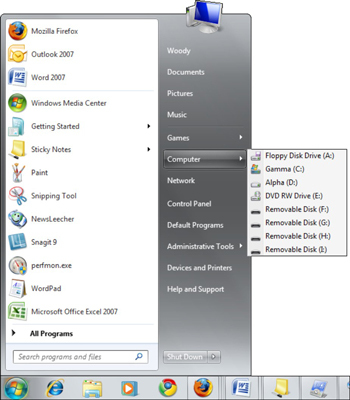 A modified Start menu showing the fly-out menu for the Computer item. Take your new Start menu for a ride.